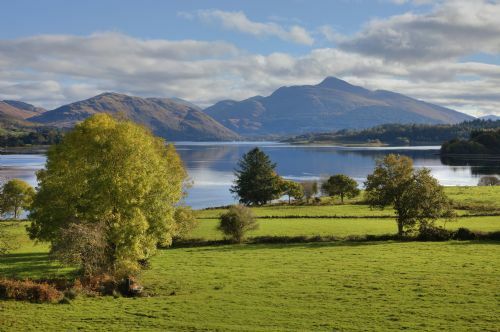 Unrivalled Location- Stunning views of Ben Cruachan and Loch Etive. 7 miles from the picturesque harbour town of Oban. This was a fantastic location for a good comfortable stay in a cleverly thought out beautifully presented cottage. A great sense of equanimity, perfect for paws and humans. The cottage had everything one would need in self catering right down to the finer detail, very warm, spacious, a most comfortable lounge suite - those armchairs were brilliant, which is a rarity in self catering, elevated with outstanding views across Loch Etive and a wonderful tranquil week was spent by all! Whilst this is not related to the cottage in any way, we are well travelled in the UK, particularly the North of England, and find Scotland, as much as we love it, really needs to address dog friendly shops and eating establishments and could draw some learning from the Lake District where dogs may enter the majority of places without question. This is a revenue stream, untapped for many where Retail could be boosted...if the lovely owners have any influence in focus Groups with key decision makers/Chamber of Trade/Commerce etc to raise this it would be good! We entered one posh shop in Inverary with money to spend to be sternly told one of our Chow Chows "was too big" so our custom was sadly lost, a first for us, they always get in on looks alone! However, we would most definitely return to this wonderful cottage in a beautiful place, 300 miles from home and 8 hours driving with pit stops for our Chow Chows was so worth it! Ben Nevis, Fort William, Arduaine lovely gardens, were amongst some of our best visits from the cottage by car. Thank you to the lovely owners for a super stay and long may you reign! We will return with Chow Chow puppy! The location of the property could not be better. It has exceptional views of Loch Etive and the distant mountains. It is easy to get to and provides a great central base for exploring the area. The property itself is extremely well equipped, everything modern and easy to use. Beautiful house and facilities in a great location. Ideal for anyone with mobility issues. Living room was especially nice. We thoroughly enjoyed our week at Tigh Grianach. Warm, comfortable and very well equipped. Amazing views down the loch. Mrs Campbell was very welcoming and ensured we had everthing we needed. Local pubs/ hotels had good food. The seafood in Oban was exceptional. Highly recommended. This is the 3rd time we have stayed at Tigh Grianach and loved it as much as the 1st. We think the improvements made are great and have been well planned out. we look forward to going back there soon. (we will be back). Delighted you enjoyed your stay and look forward to welcoming you back. spacious and comfortable with a wonderful view that changed constantly with the weather. On arrival we found the house rather cold and musty-smelling. I thought that there may have been a dog there previously, and discovered when writing in the Visitors' book just before leaving that this had in fact been the case. However, by opening the windows when we were in and just being there, the musty smell disappeared and the house warmed up. In fact despite it being a rather damp week we only put on extra heating on in the lounge for a short time on two occasions. My only other 'complaint' was that I found the mattress on the double bed a bit too firm. However, on the whole we found the cottage spacious, light and comfortable. The kitchen was very clean, tidy and convenient, and there was everything you would need for self-catering. There was even a dishwasher, as well as the dishwasher tablets. I cannot think of anything that was lacking. Mrs Campbell was welcoming and gave us some good tips for our holiday at the start, and I felt that we could have approached her at any time, if we had had a problem. This is a lovely comfortable house with superb views. Accessible to numerous places of interest with leaflets in abundance to point us in the right direction. There is everything you would need available - almost a home from home. The owners were very welcoming and helpful. We will come here again. Delighted you enjoyed your stay. Thank you for your kind comments. We had a lovely week at tigh grianach. A lovely house with a fabulous view in a quiet location. Comfy beds , well equipped kitchen and modern bathrooms. Situated in a picturesque area , perfect for walking, cycling and touring. Good restaurant choice in oban too. Hope to return .